The Polish Jinx: Glossybox June Reveal! So Glossybox works a little differently than other subscriptions. You get charged for the box somewhere around the first week of the month (so far around the 7th-10th I have noticed) and they ship at the end of the third week of the month, so you usually get your June box the last day or two of June, though this box arrived July 1st. It just took me until yesterday to get across the border to pick it up (they only ship to the USA). I promise you all, I had EVERY intention of quitting and cancelling my membership as soon as I got my May box. I only wanted the Bergdorf Goodman box. I mean, come on!! $21 for a box full of high end samples AND a $25 gift card to BG? I mean how can you pass that up? The box was free! And then I saw a preview of June and had to get it. The box is $21 and inside it is a full sized $18 strangebeautiful colour block. You all know I love the brand, and it made the rest of the box $3! Now as it turns out there were THREE full sized products in this box - an $18 colour block, a $10 hand lotion (given to my mom already), and an $18 shadow pencil. So that is $46 worth of stuff without the other two samples. The RUSK texturize spray is a $3.75 value, but we all know that when buying the travel size bottles, we pay more than double that just to get the convenience and the last two mini dry shampoos I have purchased for travel have been in the $8-$10 mark even though the value of product is next to none. Then another sample size (though deluxe sample) of a body butter which has also already been given to my mom. All in all, I am pretty happy with this box, and feel even this oh so picky blogger got her moneys worth, even after giving two of the products away! Oh! And a surprise gift card with a secret value of between $5-$500. What a flipping joke. I was annoyed at my $10 but it seems most people got $5. Shipping is like $8 and everything on the site is overpriced to begin with. It would have been one thing if there was an item from C Wonder in the box and then a coupon for free shipping or something. But a gift card that doesn't even cover shipping and has no connection to the box actually just pissed me off. It felt like a way to pretend they were adding a bonus when in reality, its garbage. /End rant! NOW.. 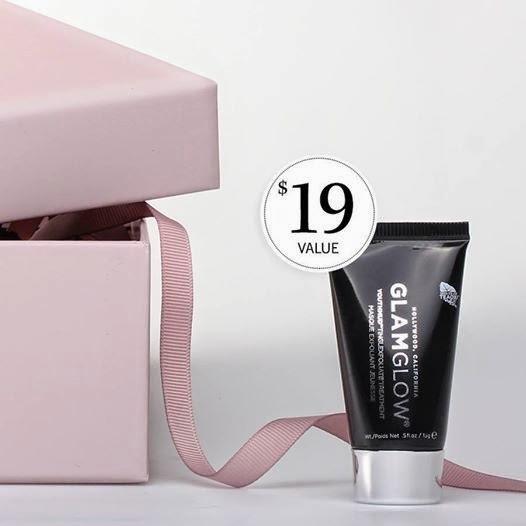 IF you are interested in signing up for glossybox, now is the time to do it! In the next box we are all getting the Glamglow mask!!!!!! The $19 sized one! So yes, I am sticking around one more month. As long as they can show me ahead of time that I will be happy with my box, I will hang around. 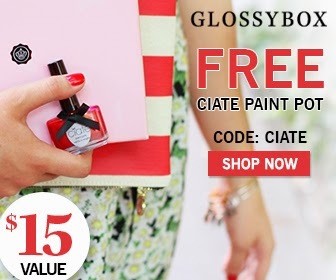 And if you are interested in getting the box ($21 and a guaranteed $19 face mask), make sure you use code CIATE to get a free nail polish.